The Team at Beacon Windows specialize in corroded wheel and frame extrusion issues, glass separation, damaged track and weatherstripping problems. Often sliding glass doors that seem to be on their last legs can be repaired to like-new condition. We will never sell you an expensive replacement when a cost-effective repair will do the job! See our Services Page for more information about what we do, and what areas in Florida we serve! Click the links below to read some articles in the Press. Learn how Beacon Windows can provide you with a quality solution to FIX your doors instead of having to replace them. Save tons of money and have us repair your sliding doors! Yes. Typically this is done over the phone. We see and repair several thousand doors a year. What may seem unique to you is likely something we are seeing over and over again. Because of this we can generally give you an accurate estimate over the phone by asking you discerning questions to help us identify what is going on in your door system. Depending on your answers we will know if you have something more than the typical going on. If your door situation is determined to be unusual, we may make a preliminary trip out there to determine if it is something we will be able to fix. In over 4000 doors we have fixed we have only had 12 so far that were beyond repair. Sometimes it wasn’t even the door that was the issue, but the structure AROUND the door that was the risk. Trust me, we can likely fix your door. During the interview process we will review with you in detail HOW your door is supposed to function and give you clear illustrations to help you understand what we will be working on and how it will affect the door system. Many of our clients really appreciate this attention to detail in the estimating process and feel that the time we take to complete this process allows them to understand better how their doors work, thus allowing them to know in the future when they have a problem. TIP: Call Lizette and expect to spend at least 20 minutes discussing your personal door situation. You can reach her at 727-641-8106. We will review door openings and configurations. How do I determine my door “openings”? Be prepared to outline how many door openings you have. A door opening consists of a door in a certain location. For example, if you have one door in the living room, another door in the dining room, and a 3rd door in the bedroom, the correct answer to how many doors you have would be 3. Once we have determined how many different door openings you have, we will then work on what are the actual configurations (how many pieces of glass and way they move) for each of the openings. How do I determine my door “configurations”? We need to know in each opening how many pieces of glass you have from left to right, including the glass that does not move. For example a 12 foot or 16 foot door that has 4 pieces of glass where the two in the middle move outward over the two on each end is considered a 4-panel door- even though ONLY 2 of the panels actually move. This configuration is called an OXXO in door speak. A common question is why do we need to know about a piece of glass if it does not move? This is because the doors work together as a system just like a person’s spine. When one piece gets out of whack it affects the whole door- including the non-moving panels. TIP: In door speak, X’s move whereas O’s are stationary. Why do you need to know how many panels there are in total- whether they move or not? Doors are systems that are designed to work in harmony. Just because a door does not move does not mean that we will not be addressing issues in that door. What is a pocket door? Do you work on those types of doors? Many time we see doors where all the panels move and they pocket completely OUT of the opening, generally to an open “pocket” outside of the home. This is called an “EXTERIOR POCKET DOOR” if you can see all the glass panels, and an “INTERIOR POCKET DOOR” if the panels are hidden behind a wall system. Yes- we work on pocket doors. Are there any other issues that can add to the cost of the estimate? Yes. Sometimes there is more going on with the door than just the door components being worn. One example is when a door is impinged upon by a collapsing header or a lifting floor situation. These would be examples of where we will need to review the opening prior to beginning the work to determine if we can fix the door or if it needs to be replaced. Each case may be different and there are a number of factors we need to consider in pricing out the job so we do need to speak with you to determine this. Generally speaking however we are less than 10% the cost of a new door. Do you need to permit this work? No. This is considered a repair by the building department and does not require permitting. What else can be done to help doors against the weather? You could consider filming the interior of the glass. We do not do this work but we do have a quality company that we recommend. This will help with the heat factors typically offering about a 30% SHGC (Solar Heat Gain Coefficient). The film may also be helpful if your glass gets broken as it tends to hold the glass together. Film comes in a variety of thicknesses with 4 ml and 8 ml being the most common in home use. Film is NOT considered hurricane protection. Sometimes. We are not a glass company however. Our primary goal is to make your door highly functional. Occasionally we do encounter broken glass situations and depending on the type of glass that is needed we may be able to order that glass. Sliding Glass Doors need to be tempered. In certain locations the glass also needs to be darkened to meet the Turtle Code. If you break the glass on my door while you are working on it, will you replace it? Yes. There are a few instances where clients have specialty glass that we will not touch unless they sign off on a glass breakage waiver. These circumstances involve VERY LARGE pieces of glass or glass with a specialized color. If in those cases the clients want us to work on the glass we do require them to sign off on the liability for glass breakage. Glass breakage is very rare. It happens occasionally due to weather conditions- particularly cold. Sometimes it happens from vibration, but generally only if there is an irritant rubbing up against the glass and the vibration in combination with that irritant creates the correct environment for the glass to break. We have handled well over 15,000 individual pieces of glass in the past 3 years and have only had 7 pieces break…. So it is not really a concern in the majority of cases. Is there anything else I need to know about my door system? Not typically. There are a few exceptions on large projects that have identical windows where we will give some consideration to repairing windows. The biggest issue with window repair is sourcing the parts. With sliding glass door repair parts are more readily available versus windows where it can be difficult to impossible to get the correct parts. There is definitely a financial value to repairing a sliding glass door whereas due to the higher costs and difficulties in getting parts, there may not always be a value to repairing a window. However if you have a large window project with several hundred identical windows, please feel free to inquire. If we feel we can make a substantial difference in the window’s lifespan for a reasonable investment then we will consider this on a project by project basis. Is there anything else I can do to help my doors be more resistant to weather? Yes. A couple of ideas come to mind. Review the caulking on all the non-operating panels and make sure there are no cracks. Use a high quality exterior caulking with plenty of elasticity to account for contraction and expansion. Consider making moving panels that you do not use often into NON-operating panels. This can be done by removing the wheels and putting in stops in the top and bottom track to secure the door from moving. This strengthens that non-moving panel and makes it more wind resistant in a storm. It is still NOT hurricane resistant, but it will be less inclined to move in an aggressive wind situation if it is permanently affixed and caulked into place. TIP: Clean out your weep-holes in the door track to keep water from building up too high in the track and spilling into the house. We may consider repairing your screen door if there is sufficient life left in the door. Screen doors are generally not made in the same way as door panels. Typical screen door extrusion is about 1/3 the thickness of a standard door panel, and the screen track that the screen rolls on is also poorly made, more like a thin ice skater’s blade rather than the bulbous, rounded track that your glass panels rolls on. Because of this difference in quality screen doors never move as well as glass doors do. TIP: Use a wire brush to burnish the screen track free of burrs and debris. Clean the track several times per year. If you screen door is beyond repair, we will recommend a company that manufacturers new screen doors for you. We do not make new screen doors. Our specialty is in refurbishing the SLIDING GLASS DOOR PANELS, not screen doors. Do you also replace sliding glass doors? Yes, we do occasionally do replacement work in Pinellas County. Our primary focus however is sliding glass door repair. What are some factors I should consider with replacement? Replacement in Pinellas County requires that the sliding glass doors meet current building codes. This means they must be IMPACT DOORS or have Florida Product Approved Hurricane Protection over NON IMPACT doors. IMPACT DOORS are much heavier than the older style sliding glass doors. Because of this they have a tendency to be more difficult to open. If you want to learn more about the specifics of IMPACT DOORS, please feel free to reach out to me. There is a lot to learn and understand about glass options. From a maintenance perspective however we have been surprised to be receiving a LOT of calls from people who have recently replaced their doors with impact. It seems that about 4-5 years into their lifespan the doors really start to show wear. What issues should I look for in my IMPACT DOOR? 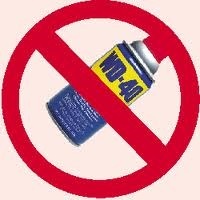 So if you are anti WD-40 for tracks what should be used? DRY lubricants are best. We use a couple from the big box hardware stores. You can purchase DuPont Teflon Spray or Liquid Wrench at LOWES and Blaster Dry Lube at Home Depot. The reason you want to stay away from WD-40 is because the grease-based lubricants allow for the dirt, sand and salt to stick. TIP: Lubricate locks regularly. First wipe them thoroughly to remove any salt or debris. Then use dry lubricant liberally. TIP: Another place you can lubricate is the weatherstripping along the top track to help the doors move more smoothly. What is “Pregnant Door Syndrome”? Pregnant door syndrome is a very serious condition in a door. This is caused particularly when doors are STATIONARY for long periods of time, but have wheels in them. We see a lot of this along the beach coast in rental units where some of the doors are NOT moved often. We also see this in certain door systems that have rods or metal pieces inserted within the aluminum extrusion. Over time these pieces of galvanized steel degrade and then begin to expand. Eventually if left unchecked, this expansion will destroy the extrusion. Click Here to see a video showing how this issue can ruin a door. 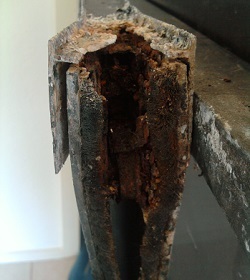 It is NOT just rods in certain doors that can cause this condition. The other problem that we see very regularly is doors that have wheels in them but are not moved often allow the sand, salt and wind to drive the dirt deep within the bottom rail or extrusion, settling around the wheel systems and eventually forming a crusty corroded mess that begins to eat the wheels away. Once the corroded, decaying situation has bridged from the wheels to the inner walls of the extrusion, the decay begins to destroy the inside of the aluminum rail. TIP: If you are experiencing any “fatness” around the far left or right side of the door in the bottom rail or extrusion area, you have “Pregnant Door Syndrome”. Typical symptoms start out with this fattening of the aluminum. Eventually if left unchecked, this corrosion will work its’ way through the aluminum, creating small blisters, then tiny holes, working their way up to dime-sized and then nickel-sized holes. We have seen doors that have entire ends of each operating door both inside and outside completely EATEN away, like leprosy or cancer. If not addressed, this situation could lead to the destruction of the door itself. We have however been successful in addressing this issue even in very advanced states of decay. This would NOT be something we suggest you tackle yourself however. TIP: Hire a professional who knows what they are doing and get on it as soon as you realized the problem exists. At Beacon Windows we have seen this condition over and over again in door systems. To remove the rods from the extrusion pieces we actually invented a special device to allow the soft aluminum to be separated from the hard and corroded steel without destroying the aluminum. TIP: Examine the left and right side of all your doors, particularly doors that CAN operate, but that you do not typically move often. Be sure you move those doors at least several times monthly to knock the corrosion down. Then clean the tracks and keep them free of salt, sand and other debris. Are there other corrosion issues to watch for besides “Pregnant Door Syndrome”? Yes. We frequently see tracks that have been corroded by wheels that have been left in a stationary position for long periods of time. This is a precursor for “Pregnant Door Syndrome”, and just like locking issues being like a fever in a person… helping the Doctor know there is more going on, corroded tracks tell us we need to look at the wheel systems and remove the corrosive element. TIP: Regularly examine your tracks thoroughly to look for imperfections, divots, dings, and corrosion. All of these complaints stem from some common issues… weatherstripping is either non-existent or deficient and possibly due to misalignment the door panels are not meeting tightly. We can help all these issues, sometimes dramatically, by addressing the most common and sometimes most difficult to fix issue… the weatherstripping. Corrosion has a tendency to beat up weatherstripping grooves, making it difficult to replace. Because of this most companies will not even consider touching your weatherstripping. However in Florida due to the aggressive elements and extreme sun conditions, this very much needs to be addressed. We regularly replace weatherstripping that is challenged, generally making a dramatic improvement in the door’s ability to withstand the weather. TIP: Check your weatherstripping. If it seems to disintegrate when you rub it aggressively, then it is time for you to replace it. Click Here to see a video about Weatherstripping Woes! For a case study on weatherstripping in a local condo, watch WEATHER or NOT ! Lock problems in a door many times are like a fever in a person…an indicator of a much bigger issue. Frequently the misaligning door causes the lock to work poorly. Sometimes however the issue is the lock is loaded with corrosion. TIP: If your lock seems to be functional check for the door alignment using the first point under Crack Attack to determine if the door is crooked in the opening. Many times by simply realigning the door system you can “magically” get the lock to work. TIP: Clean out and lubricate your locks regularly. We are seeing a number of newer doors, replaced in the last 4-7 years, Hurricane Resistant IMPACT doors that are experiencing a lot of broken lock issues. One of the reasons this is happening is because the weight of the newer doors is at least 3 times the weight of the older door systems. Their wheels are not designed to take that much weight and so they fail at an earlier life expectancy even if they are quality stainless wheels. When they start to fail one of the first indicators is the crushing of the locking mechanisms. Many times I can tell which way the door is tilted (crooked) by simply looking at the lock damage. If it is crushed from the top of the lock, the door is tilted heavy at the top. Crushed from the bottom of the lock indicates tilting away from the bottom. Understanding this is key to keeping HEAVY impact doors functioning optimally. As expensive as they are to initially purchase most people don’t realize that you MUST keep them maintained regularly or run the risk of seriously damaging not only the locks, but also crushing the tracks. TIP: Replace wheels on IMPACT doors every 4-5 years. In between replacement, keep your doors correctly aligned to avoid lock and track damage.